At the exact instant that Arnav Singh Raizada read Shyam’s message on Khushi Kumari Gupta’s phone and felt the earth slide from under his feet, Khushi was reading her name on a wedding card with a tremulous smile. “ee dekho manno hum shadi ka carad ooha dur vides se banwai laye hai“. An astute benevolent man was near his displeased, bearing the weight of heavy gold, heavy wife. She had reason to be angry of course. 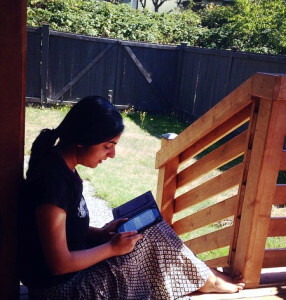 Her husband, Akash’s one and only father, had reached just the day before his wedding. A slight concession could be extended given that he hadn’t missed the event entirely, but Manorma wasn’t in a very forgiving mood right now. The man who bore all her moods was here. She felt rather light and care free which of course meant she was enjoying all the attention. Khushi watched mamaji and mamiji in wonder as she carefully placed silver coins in dainty transculscent netted pouches. One coin for each of the guests. How many years had they been together? The loud domineering flashy mamiji and the calm simple mamaji. Di has said their marriage had been a full on filmy style love saga. She would ask Arnavji for details some day. Arnavji.. Her hands had started to fumble.. as his name entered her thoughts, she realized it hadn’t really left her mind even for a second.. She had to bite her lips not to smile.. He.. She exhaled. Nanheji had come up and in all excitement upset the stack of coins and now mamiji was happily delegating the work of recounting to her daughter-in-law. “Akash bitwa ki saadi toh hum chor bhi dete par Arnav bitwa ki saadi ka mauka milna jara muskil tha. I had to come for that hai na Anjali bitiya?” Mamaji slurped the ginger tea Anjali had brought for him and looked on at her full of affection. There were jokes and laughter abound. Khushi who had been desperately trying to hide her smile all this while gratefully took this opportunity and let her smile get wider. devi maiyya unhone humse kaha.. aapne suna? What was happening around her was all a muddled blur. Jeejaji had come down all dressed in a royal blue sherwani and a contrasting cream churidar He even had a stole around his neck of wrinkled cream silk just like the heroes in the movies. Payal had shyly let her eyes flutter towards the handsome groom before getting back to her counting. He never lied. No. He had really said it. wo baat.. There was more laughter. Om Prakashji it seemed had been instructed to play some hindi songs, guests would be upon them. Amma, dressed in a beautiful peach colored silk saree with golden zari leaves was coming down the stairs with naniji. Even naniji has put on some extra pearls tonight. She looked the regal matriarch that she was. Khushi was right in the midst of all this, smiling to herself, eyes lowered, intent on preparing the gifts for all the people coming. Her age old neighbors from Lukhnow would be here. They were all staying with other families in Lakshminagar. Taiji had called buaji and let her know she would ensure everyone reached Shantivan on time. No one had ever witnessed a wedding into sucha grand house in lakshminagar. The whole neighborhood was celebrating their daughters’ marriage. When Khushi would look up her eyes sparkled with a brilliance unmatched. The crimson of her attire brought out her unnatural ethereal fairness. She looked young and innocent and utterly in love. She was the girl who had heard the man she was about to marry, the man she undeniably loved with all her heart, say he loved her. And she was the girl trying to keep the heady excitement a secret. dhak dhak dhak.. A tell tale gust of wind beckoned her.. She looked up and saw him. He was still not dressed.. hoonh.. Would he miss his own engagement? He briskly walked ahead and out of sight. Was he going to the roof top? “khushiji khushiji are you sure we should be giving ten silver coins to just one guest? Koi ghaas mehmaan aane wala hai kya“? 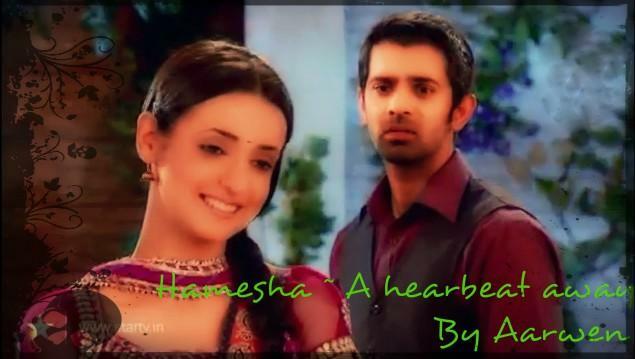 “haw“.. Khushi looked at all the coins that she had stuffed into one pouch. She hastily emptied it, not bothering to correct nanheji that it was khaas he must mean and not ghaas which just mean grass. Which reminded her.. where was lakshimji? “bhabhi aap bari khoyi khori lag rahi hai. Don’t worry chote will be here soon“. Anajli was balancing two round silver trays in her hands, but that did not stop her from joining the fun. She would soon have to go find Shyamji and verify that he was dressed and then she would hunt down chote and make sure he was dressed. All that could wait a while longer, for now there were two brides to be teased and lots of gifts to be arranged. She and nani had meticulously planned what each person at the party tonight would get. “hum.. I forgot something upstairs.. I will be back“, Khushi mumbled and rushed up the stairs. She might just make a detour to the rooftop. Her heart raced at what he would say, for even a single second she did not want to stay away. The wedding preparations continued unabated in the living room. Shyam stood rigidly straight, his stocky arms folded across his chest. There was no time left. If a wedding was supposed to happen tomorrow, it would not have Arnav Singh Raizada as the groom. It was all crystal clear in Shyam’s mind. If he killed Anjali the wedding would surely get postponed, and then eventually he would kill ASR too. However there was the complication of money. Aman was too sharp for his liking. He had called on Anjali’s phone and verified every single transaction from Anjali’s account in the past few days. Then the account had been closed making matters even worse. A few days of no money from Anjali had made Shyam certain of one thing. He needed to confirm he got all the immense Raizada wealth before the siblings died. His silly idealistic teacher in the orphanage Shyam grew up in had always stressed on morals. For many years Shyam had believed him. He had spent time reading the scriptures, been polite and a decent boy. Till he realised that was not enough. He wanted it all. He wanted Anjali and her money. And now he wanted Khushi. She would be his. And what fun is getting the girl without the money! Shyam would have it all. Om Prakash had been telling Payalji that he thought he had seen Khushiji’s phone left behind in Arnav’s room. He had taken a chance. Desperate times called for desperate measures. Arnav had walked right into his downfall. It was time to lay the death blow. ASR had not waited to think about what he would see on the rooftop. He had simply made his way here. Shyam stood before him. A part of registered the fact that khushi was not here. “I read your message to Khushi“. He marvelled at how his voice remained levelled. He had to remain in control. Soon Shyam had turned and there was no time to think, only concentrate on breathing as he let Shyam’s words fall on his ears. “arre saale saab. You read the message? Reading others private message is not nice, you know? Chaliye now that you read it you know that Khushiji and I planned this all along. Do you think a girl like her could have any sort of tenderness towards a man like you? Dekhiye bura mat manana, but you have to admit she is better off with someone like myself“. ASR’s nostrils had flared, sharp jolts of anger slashed against his chest, he clenched his fist with such great force that his immaculately trimmed nails dug into the tender flesh of his palm. A few more minutes and it would bleed. Yet he stayed silent. “arre Khushiji toh aapko bardasht bhi nai kar sakti pyar karna toh door ki baat hai. Love is what I have for Khushiji. She is my junoon. She did feel a little bad tricking you Arnav, but for my sake she can go to any length. Just how I can go to any length for her“. ASR found himself lunging out at Shyam, when a broken scared voice spoke from behind him. He didn’t turn to look at Khushi. He did not need to. He did not want to hear what she had to say. “don’t you dare say a word“, he addressed her with icy cool, his back still towards her. His hand had tightened around Shyam’s lukhnowi Chikan kurta. His deadly gaze remained on Shyam. “I told you I don’t want to hear what you have to say“. His words cut through the still night air. With a shrug he let go of Shyam’s collar, then took a measured step back, but Shyam had swiftly moved forward. “You came Khushiji. No need to hide it anymore. We have nothing to fear“. While speaking Shyam extended out his hand, but a firm unshakable hand caught his mid air. ASR had shifted his position to block Shyam. He could feel Khushi move closer. Cold and shivering her fingers clutched his shirt from behind. There was a untamed wild air in him as he spoke, “Khushi tumhe is aadmi ki wajah se mujhe explanations dene ki koi zarurat nai hai“. Before Shyam had a chance to blink ASR had punched him right across the face. Shyam felt his canine cut into the lower lip, he could taste the salt as blood trickled through the tear. He staggered at the impact and out of instinct cowered back. “Arnavji leave him“, Khushi had placed her hand on ASR’s shoulder, trying to restrain him. ASR shook her off and took a menacing step towards Shyam. Through the pain Shyam managed a demented sneer. “So, you don’t want to believe me? Chaliye rehne dete hai aaj ke liye, but you can’t do a thing to me and you know that. After all I am your only sisters husband. That handicapped girl whose mother and father committed suicide and left her alone. I gave her support and since you are a good little brother you have to do what she asks. Wo humari puja karti hai. She will not hear one word against me. It is fate that I came to help her and now she will help me get Khushi. All you can do is watch Arnav. you are powerless“. This time ASR grimaced in pure loathing of the man in front of him, before he slapped him hard across his face. “That is where you are wrong. I am not a good little boy“. He gritted his teeth, his jaw hardening. “I am Arnav Singh Raizada“. He stated his name with a sheer staggering power that clung to the words. “And I am never powerless“. Now his voice had started to rise. “At the remotest chance that you do manage to get out alive from here di ko apni shakal dikhane ki himmat bhi nai karna“. Shyam felt like his head had split open when ASR’s fist had landed on him in another shattering blow. His voice was a roar as he spoke, Khushi was pleading for him to calm down. “Arnavji you will end up killing him. please stop“. Everyone burst onto the roof during this juncture of the show down. They were aghast to see the sight. Akash hastily went to stand next to ASR who was breathing rapidly. Shyam wiped a trickle of blood from a gash on his forehead as he made his way across the rooftop. He pushed past Anjali who had cried out in alarm. “Shyamji, what happened to you?“, she frantically tried to hobble after him, but a firm hand stopped her. “di let him go“. ASR’s voice was hollow. “di I can’t let you breathe the same air as him. He can’t be here. Please trust me. I told you.. he has been cheating on you.. And Khushi. Please meri baat mano di.. wo aapke layak nai hai“. ASR implored, with his voice, his eyes, his entire being straining to have Anjali understand. When Anjali finally spoke after a prolonged silence, she seemed listless. “That is for me to decide Arnav“. Her face had lost all emotions and an uncanny blank stare replaced it. “di everything will be fine di. 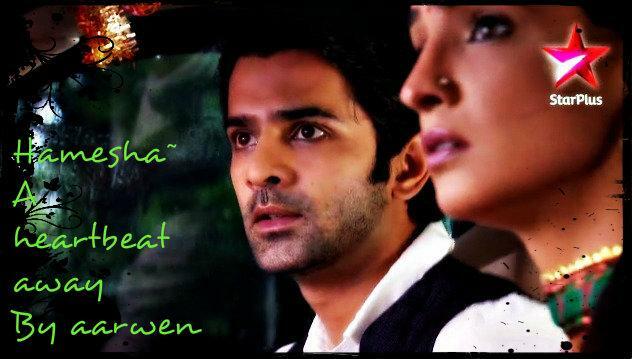 I’ll explain“, ASR tried to curb the sheer panic rising within him at Anjali’s words. He felt young and helpless. Things were spiralling out of control. The piercing sound of a bullet shot rang in his ears. She had spoken like a stranger and seemed to look right past him. “babua thik bolat hai Anjali bitiya. Hai re nand kisore we should not have kept quiet all this time“. Astonished faces turned to hear buaji speak up. She walked over and took Deviyani Raizada’s hands into her. “hum logan ka maaf kar dijiye nand kisore. For our daughters sake we feared to tell the truth, but this is for the best. Shyam babua has not only betrayed Anjali and you all, but even us. Ooka bas chal jata toh humri dui dui bitiyan ka ghar barbad hui jata. He would have detsroyed Anjali bitiya and khoosi. It is all my fault“. Buaji had placed both her hands on her head and would have continued apologizing, but she noticed Anjali turn around in a trance and make her way to the door. Payal and Akash rushed after her. “ye aap kya keh rahi hai Madhumatiji? What is this happening in our house?“, Deviyani Raizada tried her best to keep her voice from breaking, but she could feel her hands shaking. Were they actually insinuating what she seemed to grasp? Had damadji actually planned on cheating on Anjali bitiya? In an eerie way the past came rushing to engulf the old lady. She had lost a daughter to the cruel clutches of adultery. Mamaji finally spoke up, “koi thik se kuch batawega ki naahi“? “Come with me mamaji.. aap sab.. we will explain everything“. Sounding suddenly more mature than usual, NK shepherded the elders downstairs. Akash had already given his a gist of what is brewing and Gupta family seemed to have the rest of the details. That would be enough to answer any questions for now. He had looked at ASR’s ashen face, and Khushi’s tear striken face and surmised they needed a moment to gather themselves. An hour later a visibly shaken mamiji stood by the main entrance of Shantivan bidding farewell to the early guests. “hello hi se pehle hi bye bye aaj hui gawa“, she said to no one in particular. It was a mark of her harried state that a few wayward strands had managed to escape from her bun, dodging the hundred pins that had been jabbed into it. A few petals from the yellow rose on head had also wilted away. Luckily the red roses were still in perfect shape. Her kaajal was smudged and she had no time to fix it. “bhat issublime tragedy eet eej. Hum toh first se hi bolat the. Gayab rehna phor many many dayj. Hum sab ke eyej mein dhool jhoka.. par how. Manorama Raizada naahi dekh payi oo toroo colorj“. “ka khud mein hi barbar karat ho mano“? Her husband had come pulling a chair on which she promptly sat down. Luckily Om Prakash showed up with another one for the mamaji of the house to sit on. A group of ladies from the girl’s side were on their way out. Hari Prakash and mamaji nodded at them while mamiji pretended to ignore them. One middle aged non-descript lady in a jarring orange silk saree was talking in a stage whisper to the equally jarring pink saree woman next to her. “This wedding will also get cancelled it seems. Poor Payal bitiya. Just her bad luck. Two weddings cancelled. I am feeling bad for Shashiji and Garimaji“. Mamiji heard the lady that resembled a florescent orange. Broken wedding.. It transported her to a wedding fourteen years ago that had not taken place. Her dear niece, Anjali, so very young at that time, had been abandoned by her mother, her cheating father, and the groom who would never have made her a good life partner. She heaved herself of the flimsy maroon velvet chair that the wedding decorators had sent to Shantivan. Then loudly she called out to all that glaring orange , “hello hi who eej issaying ki Payal bitiya ki shadi cancelling. Manorama Raijada bhill making issure that wedding bhill happeningj. And you bhill miss all good issnacks and isweet dishej becoj you are uninvited. Bye bye“. Pleased with herself, she went back to ignoring the glances she got from the rest of the ladies who were on their way out. Then, suddenly realizing what an awful evening this was turning out to be for all her children she sniffed sadly. “waa oo hui na mano jisse hum shadi kiyat rahe“. A gentle hand had made its way onto her shoulder. Behind a weary glance her husband was fondly smiling at her. His eyes reflecting the memories of the years they had shared together. “aap toh bas shutupiya hi kar lo“, she rolled her eyes, but let his hand remain where it was. Khushi slowly tried to understand what had taken place. Shyamji had said all those vile things about her, and just when she had been convinced Arnavji did not want to even look at her, he had said he believed her. She stared at him, a single tear rolling down from her eye. di’s words had crushed him… but there was something before that, Shyam had let it out casually. devi maiyya itni bari baat.. had Arnavji’s amma and babuji really taken their own life? She neared him. More tears wet her face. It was some time before his eyes moved to her. He looked broken and exhausted. “tum thik ho?“, he asked in a dull gaunt voice. His voice reminded her of their first meeting. There had been a detachment in tone, as if he was far away, not right in front of her. Even when he was angry his eyes had remained strangely dark. She had forgotten how used to she had gotten of the gradual changes in Arnavji. This reminder of the reticent man in a shell of the past unnerved her. She shook her head and ran towards him, flinging her arms around him. For an excruciating moment his arms lay limp at his sides. She could hear his heart quicken, but his body remained immovable. Then, how pigeons gain flight with a slight flutter of their wings, breaking through the clutches of captivity, her Arnavji took a deep breath, and broke out of the past, soaring free. His hands encircled her and held on tight. The time for words would come, for now two heartbeats did all the talking. hey,this is perfect..Arnav’s trust in khushi,anger on shyam,helplessness thinking of his di..
finally the truth is out..though it will take to accept it it will be good for them..i love Mamji here..sometimes we need people like mamiji to take care of such rude guests..